In October 2017, I had the opportunity to shop at a newly opened Wegmans location in Whippany, New Jersey. It is highly recommended to me by a fellow member of Green Summit, alluding that it is a wonderful store to zero waste bulk shop at. Since this store opened in July and has been open for nearly two months before I visited I had expected everything to be in smooth working order. Read on to find out if it was! Also, I was so busy shopping that I forgot to take many photos of the store in general. Sorry about that! Like most other food stores they had the wide selection that a shopper would expect, from produce to deli and seafood. Wegmans had all your standard departments and then some. I was very excited to search for new bulk food items. Especially since I had been told that is what is the most wonderful part about this new Wegmans. 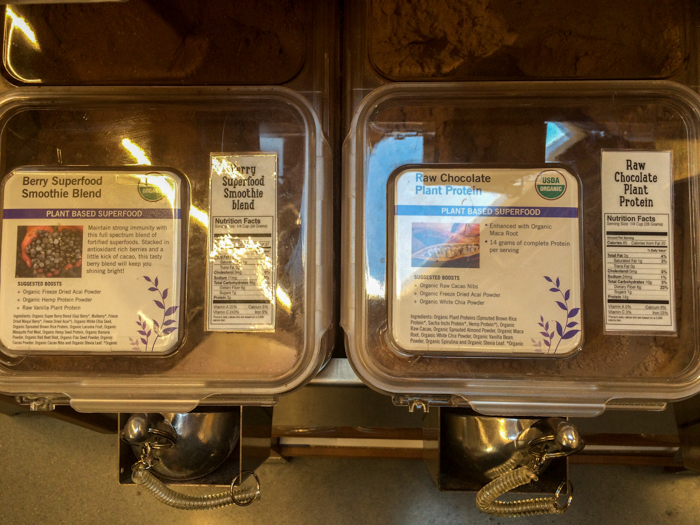 There were two new-to-me bulk areas (not just because it was a new store,) bulk tea and bulk smoothie powders. I’ve come across tea before at Basil Bandwagon but they carried some exotic types I didn’t care for. 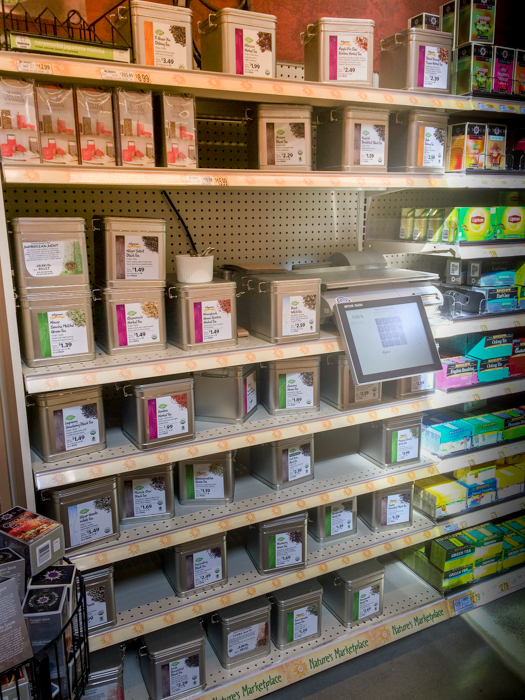 I looked forward to some basic type teas, such as chamomile, early grey and green tea – Wegmans had those and many more! Being able to get the basics without wasteful packaging is great. However, if you didn’t happen to bring your own container, they did have small paper bags to use for the tea. Though I didn’t check if they were wax-lined, which would be something I’d recommend passing on since it has a high chance of not being recycled because of the lining. Smoothie powders were a much welcome surprise, as I have not seen that in bulk at stores before. Small plastic containers were available if you didn’t bring your own. According to their store policy, which I asked about at customer service, they permit customers to bring their own container as long as it has the tare weight and product number labeled on it before check out. They did also assure me that cashiers do know how to tare the weight of your personal container. It was all a wonderful relief to learn! In a matter of marketing and advertising, I think the ‘Build Your Own Granola’ bar was a fantastic idea, especially if you didn’t like any of the pre-made bulk options. Since packaged granola usually doesn’t come in easily recyclable packaging. Though I must say, I truly love making my own granola at home. This is the next best packaging-free option. I was pleased to see many organic meat options and even in its own separate display case. It was also really great to see a comparable pre-cooked rotisserie chicken option of organic and conventional birds. Though I will say that late morning/midday the organic rotisserie chickens were already sold out. I stood around waiting for a bit to have more brought out as I could see the employee behind the counter readying them for packaging. However, I soon lost patience of waiting as I hoped I would return to that department to grab one before I checked out. I ended up forgetting altogether and didn’t go back to purchase one. These were all of the good things that I feel Wegmans is worth the visit for. Find out below what exactly disappointed me about this store, also known as the bad things about this Wegmans locations. 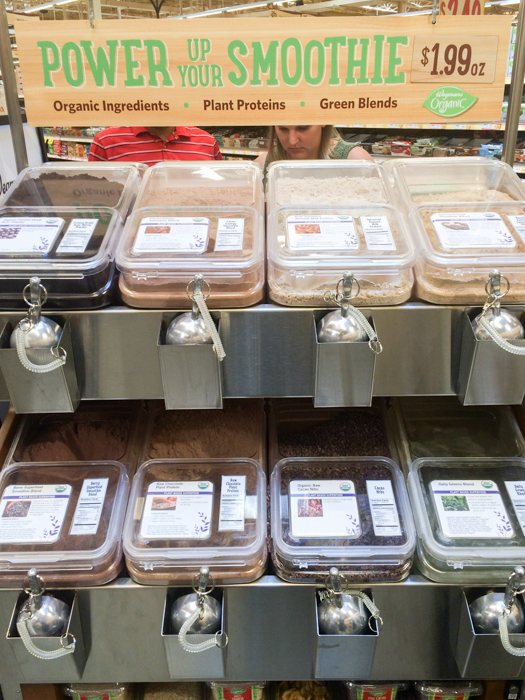 This bulk section had the chance to be something really wonderful for all of those zero wasters out there that are struggling to find the exact basics they need. Unfortunately this bulk section lacked any of the basics beyond rice and lentils really. I couldn’t seem to find any flours or sugars at all. Organic cane sugar is something I’m so glad my local Whole Foods Market carries in the bulk aisle. Even if it is more expensive per pound than purchasing in a plastic bag. I had hoped Wegmans might have some basic baking ingredients that I haven’t been able to find package-free, such as baking soda, baking powder or iodized salt. I don’t believe they created their bulk section with any zero wasters in mind. If they had, it would have been an amazing resource for package-free products. 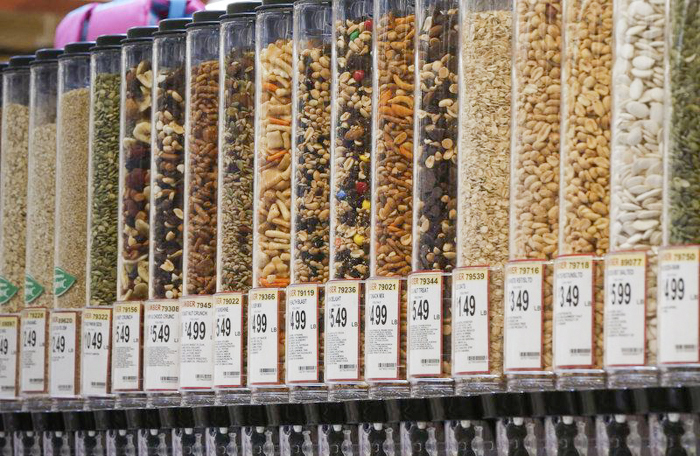 I don’t think having the bulk section only 1/4 the length of a single aisle was offering many options. They need to expand to be able to reach a larger community of sustainable individuals who are where and how they shop. By making the right products available to consumers there is a much higher chance of brand loyalty being the thing that drives them back to shop there again. I know that is what drives my shopping choices, since I can get certain foods unpackaged at certain stores. I will continue to be their customer since it allows me to shop on my terms, my way. This is the case with the produce at Wegmans, if I’m going to find my product plastic-free, then I’m going to stick with shopping there. Wegmans produce section failed big time for me, but more on that later. I’m more frustrated that I truly searched and searched and was not able to find the organic bananas. Despite being highly promoted on a large sign above the banana display. Now, don’t think I’m crazy for saying I couldn’t find the bananas under the banana sign. It seemed that all of those bananas were the conventional type and not the organic ones I seek. For extra confirmation I began checking produce stickers for organic labels, with no luck. It’s very bothersome to seek out a product that is clearly advertised but nowhere to be found. From the overall theme of the produce section, I seemed to have felt that organic foods weren’t a high priority for this store. The organic produce section was unbearably small and unimpressive. The carrot bunch was wrapped with a rubber band and the fluffy (edible) carrot greens were already chopped off. Don’t they know carrot greens make wonderful pesto? Carrot greens should definitely be sold still attached to the carrots. There was also no package-free lettuce sold anywhere in the store. Even the organic zucchini that is package-free is terribly disappointing in size compared to the organic zucchini I purchase at the local farmers market. 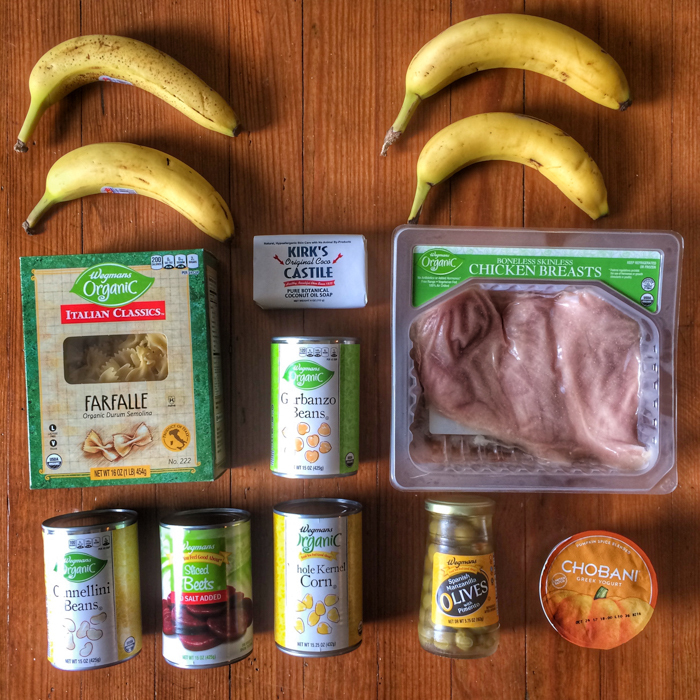 If I’m going to pay up for organic foods I do like to get the most bang for my buck. 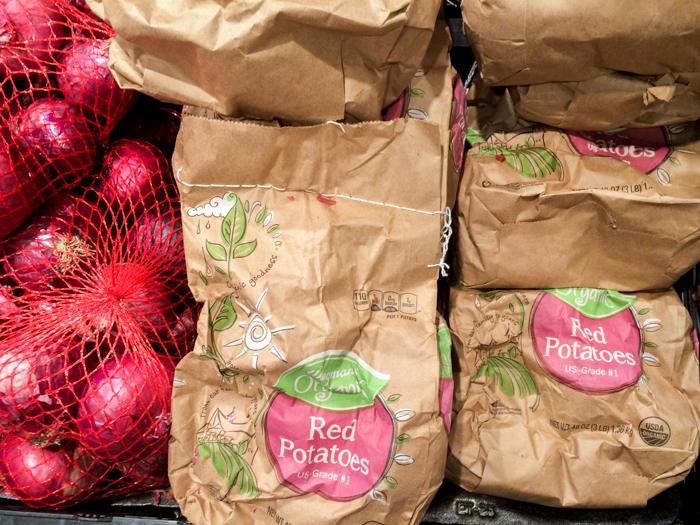 The only good thing about the produce department was a small display among all of the other plastic net bag potatoes, that had potatoes in a paper bag. This is how I recall potatoes being sold in the stores when I was younger. Practically waste-free, except for that little mesh breathing window. Loose potatoes would have been even better, but those didn’t seem to be available in this store. I had a feeling that Wegmans isn’t the all natural food store I want it to be. Mainly because when I walked past the beauty aisle and saw many mainstream (read bad for your health) beauty products. With Wegmans stocking those types of products, it was pretty disappointing to see. They did have a few well known alternative beauty brands but those are brands I see easily available else where. Especially since those too aren’t the best of ingredients either. Wegmans could have done better in that category too. I found that the ugly part of my Wegmans visit was that all the fresh baked in-store bread. It is all packaged for display in some sort of plastic or plastic/paper packaging. There was not a single loaf that was even available to have put into my own bag. It wouldn’t have been so terrible if the bread was only in a paper bag, if I couldn’t have it in my own. However, none of the baked goods were like that. All of these bread bags are either the standard stretchy plastic type or the wax paper and cellophane window type. With all of that packaging, I opted out of purchasing any breads at all. From a zero waste standpoint, I had hoped that Wegmans would have understood the value of having reusable alternatives for products. I was looking forward to finding milk in glass bottles. Since so many other food stores have been stocking them besides Whole Foods Market. Nope, I didn’t find a glass milk either, which I would have happily paid a bottle deposit for. It is just another thing on the long list of tasks Wegmans could have done better to be a sustainable grocer. In general Wegmans’ prices were even higher than Whole Foods Market which was surprising for basic and non-organic foods. Organic eggs in a paper carton were a great price which made me excited. Then let down because it was only that great price to their “club” members. I would have to sign up for their loyalty card if I wanted the savings. Which I think is silly especially when Trader Joe’s and Whole Foods Market had better pricing for most items. Especially since Whole Foods Market partnered with Amazon and they don’t require a loyalty card for their sales. I honestly had thought Wegmans was fancier than that to track our shopping habits just for a price reduction. This small shopping haul is what I came away with that day. The chicken packaging was the only item that will create trash as everything else is recyclable, including the yogurt container. And yes, I do always purchase the single bananas because no one else is going to want them and I’m helping to save them from the trash. Overall I expected a lot more organic options, more package-free foods and competitive prices compared to Whole Foods Market. There was just too much plastic packaging in their store for me. It did not make me feel good about their environmental actions to shop there often. However, I will say that I truly did have a wonderful experience with an employee that I came across. All the employees were so very courteous! My cashier was very friendly, as was the “helping hands” employee in the parking lot. He came over to my car to compliment it and tell me about his of the same model. This Wegmans did a fantastic job of hiring people. These employees truly seem to care about their jobs and the customers that they service. I recommend shopping here for the wonderful service and take note of what shopping purchases might benefit your sustainable life. Do you have a Wegmans by you? Have you had success zero waste shopping there?